Book Two of the Dreamblood duet, The Shadowed Sun, stands as a perfect bookend to the first book, The Killing Moon. If N. K. Jemisin never returns to the city-state of Gujaareh, these two books would have sufficiently set up and then brought down the problem addressed between them, so that the reader never feels cheated regarding fresh storylines. 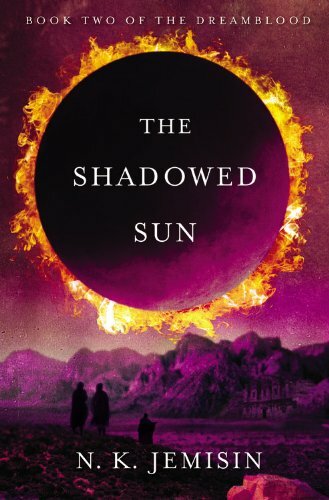 Set ten years after the climactic events in Book One, The Shadowed Sun gives us the story of Hanani, the first woman trained in the exclusively male arts of dreaming magic. It’s also the story of Wanahomen, final heir of the Sunset Throne and last seen fleeing the mess his father left at the end of the last book. Add to this a three-way political struggle, a plague of nightmares that kills, survival struggles among barbarians and civilized people alike, and a nation reclaiming its history and revising its future on its own terms—and it’s fantastic. Every bit as rich and detailed as the previous book, it flows smoothly from multiple introductions through a plot that is thick and complex but never feels tangled, to a satisfying conclusion that walks the line between happily ever after and brutal reality without compromising characters or plot along the way. The ways the events of the first book affect the events of the second are varied and frequently unexpected. The way the past actually stands in the real world and the ways the characters here navigate these treacherous waters and manage to create the best outcomes for themselves and their people—unless they don’t deserve the best—ring true more than most plot-heavy fantasies. As with the first book—despite its being half as long per volume and one volume fewer in the cycle than in her first trilogy—author Jemisin manages to create a fully realized world that doesn’t feel lacking in any respect. And when both books are read sequentially, the structure of descent and redemption lines up perfectly. Where the first book ended satisfyingly but tragically, The Shadowed Sun starts rather tragically and ends on a hopeful note for the characters and the world they steer by making history. There is plenty of potential for additional story here; if she chose, Ms. Jemisin could fill many more duets with stories of this world. But she doesn’t need to. This book ties up all the loose ends and answers all the questions left by the last one—many of which didn’t seem to have been left undone until they were addressed and resolved here. The story is absorbing and detailed, different from anything else out there, and sensual and horrible and revelatory as anything Ms. Jemisin has written. There’s the sense that she’s playing with the usual structure of epic fantasy here, coming up with an entirely new way of structuring fantasy. It’ll be exciting to see what she’ll come up with next.